Mary of Magdala was found in the crowd that had turned on Jesus as He drug the cross toGolgotha. Fickle as people are, it is not especially surprising that they had turned on Jesus and now gloried in His agony and looming death. Equally unsurprising is Mary’s presence near Jesus as He walked the Via Dolorosa. After all, Jesus had cast seven demons out from Mary and began the beautiful process of conversion and redemption. 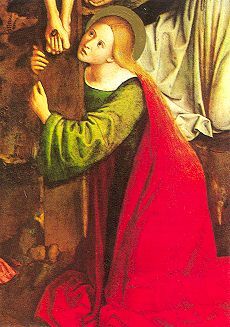 Mary’s feet were planted firmly in the Kingdom and, for her, that meant walking alongside—or at least as close as possible—Jesus as He agonized in His journey. The Twelve may have fled for their lives but Mary continued to follow because of hers. Though others may overlook Mary and focus solely on the other disciples, there can be no doubt that this devoted follower of Jesus Christ was an apostle and citizen of the Kingdom of God. She was the first to hear the good news and the first to proclaim it to the world. As is the case for all conversions to the Kingdomof God, Mary was redeemed by the life, death, and teachings of Jesus Christ and made into an instrument of God’s redeeming love. Indeed, Mary—Mary who never abandoned Jesus and whom Jesus called by name—was a witness to the redeeming power of love over death and evil.